Brown shimmer 4 1/8 x 9 1/2 policy open end envelope - Stardream Bronze: This invitation envelope is made with heavyweight 81lb paper with a pearlized finish. Order blank and print at home with a laser, or take advantage of our envelope printing service. Matching metallic slim cards are available to make your own invitations, greeting cards, or stationery. Great for use as a save the date or wedding envelope! These top-opening, open-ended policy invitation envelopes are streamlined and stylish. 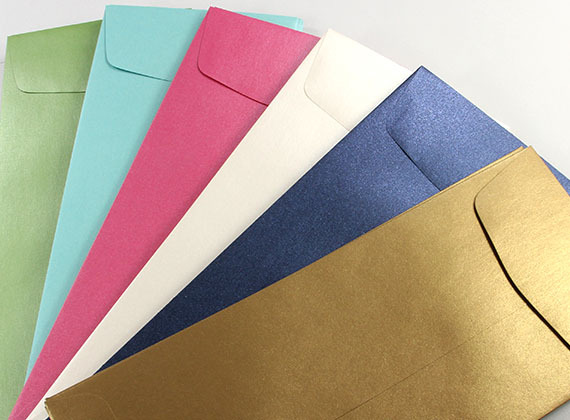 Policy envelopes are made with 81lb text weight, dual-sided metallic finish Stardream paper and are available in a variety of shimmering and saturated colors to complement your stationery design. Use for modern and edgy business mailings, save the dates, invitations, and more. Metallic policy envelopes measure 4 1/8 x 9 1/2 inches and have a gum adhesive seal. For your convenience, order these envelopes blank or printed, and pair with matching Stardream papers for a consistent look. If printing at home, please note that we have found these envelopes print best on laser printers, due to their non-porous, slick metallic finish. Policy envelopes measure 4 1/8 x 9 1/2 with a unique open end flap. Offered in dozens of top trend colors, Policy envelopes are perfect for contemporary slim invites, save the dates and stationery alike. At LCI Paper we offer matching slim blank cards (4 x 9 1/4), expertly cut to perfectly fit all our policy envelopes. 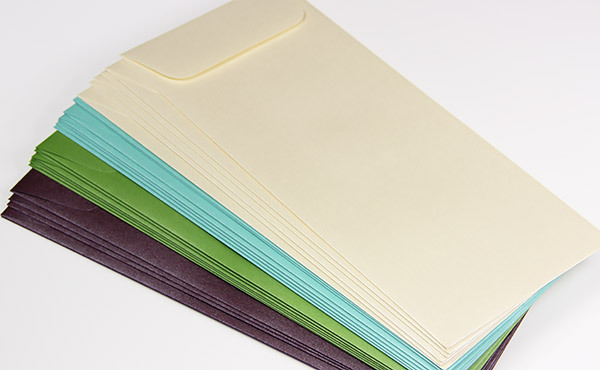 Policy envelopes and matching slim cards can be ordered blank or printed.